Bampton sits on the southern edge of the Cotswolds around 18 miles south-west of Oxford and 5 miles from Witney. It is easy to reach by car or by public transport from Oxford or Witney. COACH ACCESS TO CHURCH STREET IS NOT PERMITTED. 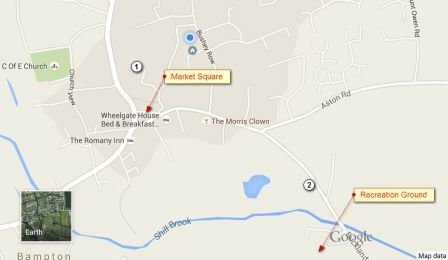 Coaches must be parked in Bampton’s Market Square (OX18 2JH) to discharge passengers as they will not fit round the narrow streets and corners in the older parts of the village. The Market Square gives close and easy access to both the historical and ‘Downton Abbey’ areas. Once the passengers are discharged, please ask the driver to park at the Bampton Recreation Ground (OX18 2AA) on the Buckland Road until the passengers are ready to re-embark at the Market Square. Among other facilities in the Square there is a Coffee Shop and a public toilet. Please see attached map. There is on street parking with some restrictions on laybys but in the evening this can be limited as much of Bampton was built before the advent of the car so residents have priority. In addition there is short term parking in the Market Square (up to four hours) and you can ususally find some space in Church Close right next to the Church, if you have a small car. Coaches and minibuses visiting us for the day - please see 'COACHES' above. For a rural village, Bampton is fairly well provided for by bus services to and from Witney and Carterton (Service 19) - at least from around 7am until 7pm, Mondays through Saturdays! 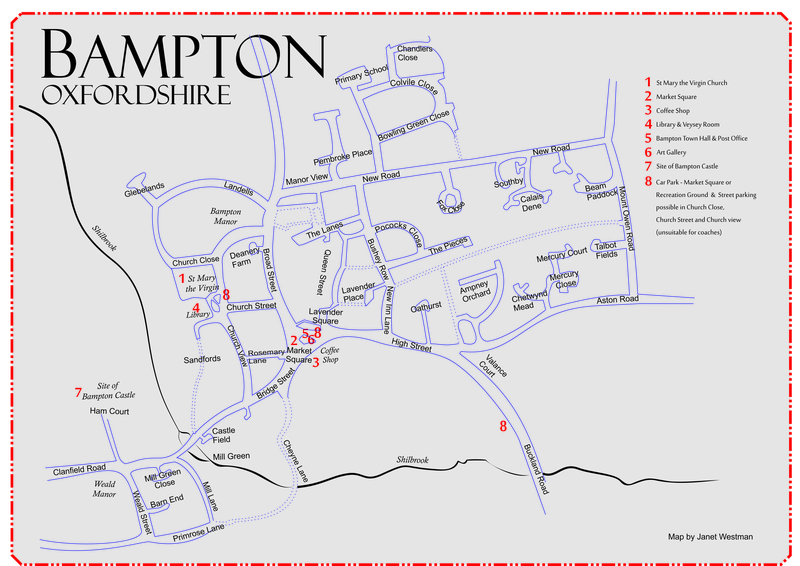 Click here to see a map of the streets and points of interest in Bampton. Many thanks to Janet Westman for producing this and allowing us to publish it. The map is copyrighted so if you want to reproduce it please contact webmaster@bamptonoxon-parishcouncil.gov.uk or you can buy a paper copy from the Vesey Room in Church View Bampton.